Dash and Cocoa are on track to win the Double Dip sled race—but only if the rest of the Candy Fairies can help them! Dash, the mintiest and speediest candy fairy, has been invited to compete in the Double Dip sled race at Mt. Ice Cream. 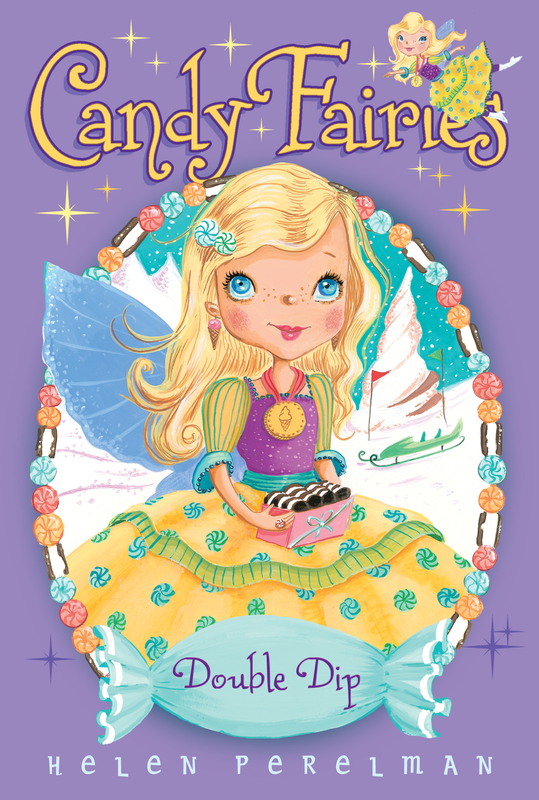 She chooses Cocoa as her racing partner and asks the other Candy Fairies to come along for the delicious adventure. Dash notices a tickle in her throat and isn’t feeling so minty, but she doesn’t tell any of her fairy friends because the race is so important to her. When Dash’s throat gets worse and she and Cocoa start arguing, the Double Dip race is in double jeopardy. How will the Candy Fairies get Dash and Cocoa back on track to sweet victory? Dash blushed. She was excited about the mini mint chips. She thought they’d be perfect toppings for chocolates or even for ice cream. Just thinking about the yummy treats made her stomach rumble. Dash couldn’t argue. “I might be small, but I do have a huge appetite!” she said, laughing. There wasn’t a candy in Sugar Valley that Dash didn’t love . . . although some she liked more than others! The two Mint Fairies settled down under the shade of a few large peppermint leaves. Dash was thankful for the rest—and the delicious fruit nectar that she had brought for lunch. “Oh, look, Dash!” Minny exclaimed. “There’s a sugar fly note for you.” She pointed to the fly circling over Dash’s head. Sugar flies brought messages to fairies throughout Sugar Valley. The flies could spread information—or gossip—to fairies far and wide. Dash quickly opened the note and then flew straight up in the air. “Holy peppermint!” she cried. She zoomed around and then did a somersault. Dash flew back down to the ground. “I just got the best invitation,” she told her friend. “You will not believe this. I can’t believe this!” She shot up in the air again. Clapping her hands, Minny cheered. “I know—were you invited to race in Double Dip?” she shouted. “Sure as sugar!” Dash said, flipping in the air again. “I can’t believe it,” Dash repeated, landing back down on the ground. Minny sighed. “I’ve never been all the way to Meringue Island,” she said wistfully. “I’ve heard that the Cone Harbor Festival weekend is supersweet. They have all these amazing flavors of ice cream and candy toppings for fairies to taste, and lots of carnival rides and parties.” She blushed when Dash raised her eyebrows. “I read all about the festival in the Daily Scoop,” she confessed. “Why?” Minny asked, taking a sip of her drink. “Who?” Minny asked. She leaned in closer to Dash. Dash imagined the green-and-purple dragon getting the sugar fly note. She and her friends had met Carobee when they’d been searching for gooey goblins. While they had been looking for the mischievous creatures, they’d found Carobee. The fairies had become fast friends with the dragon after that adventure. Dash hoped that Carobee would be part of this adventure too! “And to beat Menta and Peppa would be a great accomplishment,” Minny added.